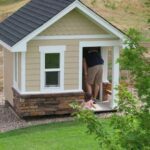 The basic principles and processes that apply to the construction of a house also apply to the building of a shed or playhouse, with a few significant exceptions. The foundation can be skids (as shown here), though this is only recommended as a temporary situation as over time it will expose the structure to moisture damage. A more permanent solution is some sort of slab. The base of the structure, which is made up of floor joists with structural plywood attached on top, is enclosed by rim joists. The walls, with the rough openings, are constructed on-site, raised into place, and then secured to the top plates and the floor. Sunset’s Sheds & Garages offers many plans for many types of outdoor structures. Just click to order at Amazon. Rafters are attached to the top plates, and then the ridge board is attached to the tops of the rafters to form the roof. 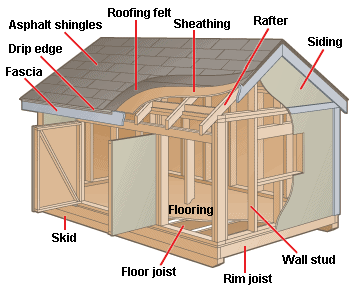 The rafters are covered with plywood sheathing, then underlayment, and finally some type of roofing material, such as shingles. Windows and doors are set in place, then the exterior walls are simply covered with sheathing and the chosen siding material; no insulation or house wrap is required if the interior temperature is unimportant. Finally, the fascia and any other finish trim are added.